Christmas Gift Baskets, holiday fruit baskets, and Christmas food gifts and packages for everyone on your gift list. Save time and money, skip the lines, buy gift baskets online today and have your Christmas gift baskets delivered straight to their door. 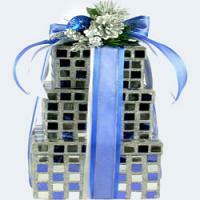 Christmas gifts, packages, and presents delivered nationwide. Find the perfect holiday gifts for everyone on your Christmas gift list. Food, candy, cookies & more holiday favorites. Send Christmas Gift Baskets by Adorable Gift Baskets; Christmas often prompts us to reflect on times past and to celebrate the family and friends we hold dear to us today. It's a time when we let bygones be bygones and share the joy with everyone - no matter who they are or what path they've taken in life. 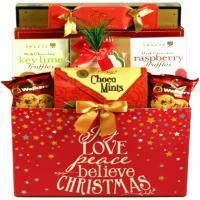 At Adorable Gift Baskets, we want to help you share that joy of the season with our elegant Christmas gift baskets. 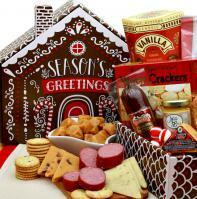 Christmas baskets are unique in that they are decorated outwardly in a holiday fashion, and they offer delightful holiday snacks within. You can buy Christmas gift baskets for anyone you know, whether it's a friend or relative, your son or daughter, or even a co-worker or your employer. Holiday baskets by Adorable Gift Baskets come in a variety of sizes, shapes, and flavors so you can easily find that special one for your recipient. Want to show appreciation at Christmas for someone who has been a big help to you? Maybe you want to surprise your employer for providing a steady job for many years. A luxurious Christmas gift basket with gourmet foods, fruit, chocolates, or a blend of holiday snacks is sure to capture their affection - and their appetite! Perhaps you'd like to send a special holiday gift to your pastor at the church. 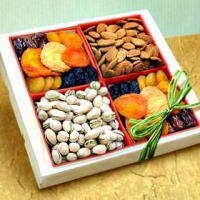 You can have an elegant Christmas gift basket delivered to his/her door made with their favorite delectable foods along with a card of appreciation. As you browse our selection of Christmas gift baskets, you'll notice many styles of gifts for all age groups and personalities. There are gift boxes, gift towers, candy cane gifts, cookie-themed gift boxes, Christmas gift trays, poinsettia baskets, holiday stocking gifts, and of course, numerous Christmas gift baskets in different colors and sizes to meet your holiday gift demands. Food assortments in our holiday baskets include items such as cookies, cashews, smoked salmon, Ghirardelli chocolate, toffee, mints, cocoa, coffee, apple cider, sausage, cheese, fruits, and many other holiday favorites. 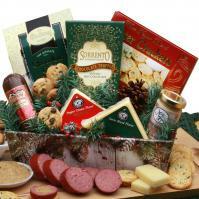 Our Christmas gift baskets feature items to suit any recipient. They are creative with freshly baked goods and high-quality packaging, so there's no worry about pleasing your friend or loved one with a delightful gift! Christmas gift baskets by Adorable Gift Baskets also give you an opportunity to shop from your home any time - day or night. If you're unable to get out and shop due to health reasons, or you just simply don't have time for hours and hours of holiday shopping, then Adorable Gift Baskets is just the place for you.